Weddings in India are synonymous with various customs and rituals. 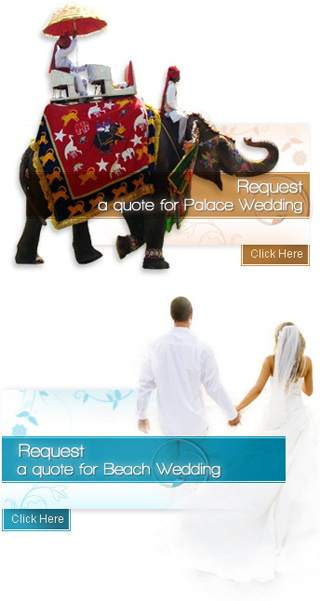 Indian Wedding customs and traditions are considered to be sacred affairs and observed with great reverence. These things are part of Indian tradition for a very long time and inherited over the generations. In recent times also these customs have not changed much but have adopted a new face with al its basic tenets. This thing adds an icing to the already beautiful cake of marriage. The Agatti Island Beach Resort in Lakshadweep consists of 20 cottages categorized into A/C, Deluxe & Non A/C. These cottages made of wood and concrete showcase European designs and styles. These cottages are equipped with all the modern facilities like attached bath, refrigerator and private verandah. These beach facing cottages has an accommodation capacity of 2 persons in each. For the dinning needs of the guests, the resort offers an array of delectable cuisines including Indian, Chinese and continental cuisines at its Thakkaram restaurant. The resort also offers outside dinning facility in Lakshadweep. The resort offer great chances to unwind. To make tourists sojourn to this island destination hassle free the resort offers an array of amenities and services to its guests. Some of the facilities offered are; laundry service, housekeeping service, doctor on request, parking and travel assistance, sports like kayaking, snorkeling, sailing, scuba diving, skiing and fishing.